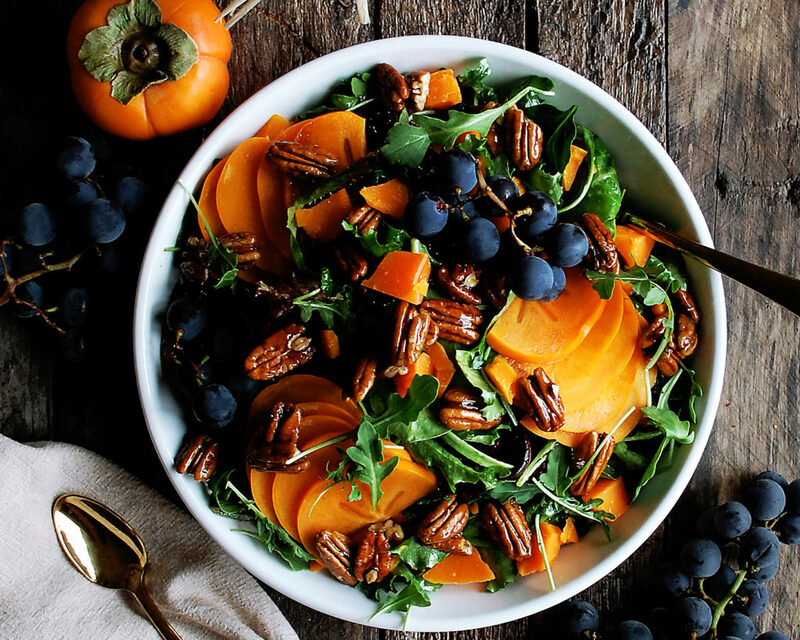 This fall salad is a deliciously simple, no-fuss kind of recipe, and the maple mustard vinaigrette is something you’ll want to have on hand throughout all of November! Usually when fall comes around, my recipes start to become a little bit cozier (and most times that means heavier, like these cinnamon apple doughnuts…yum!). 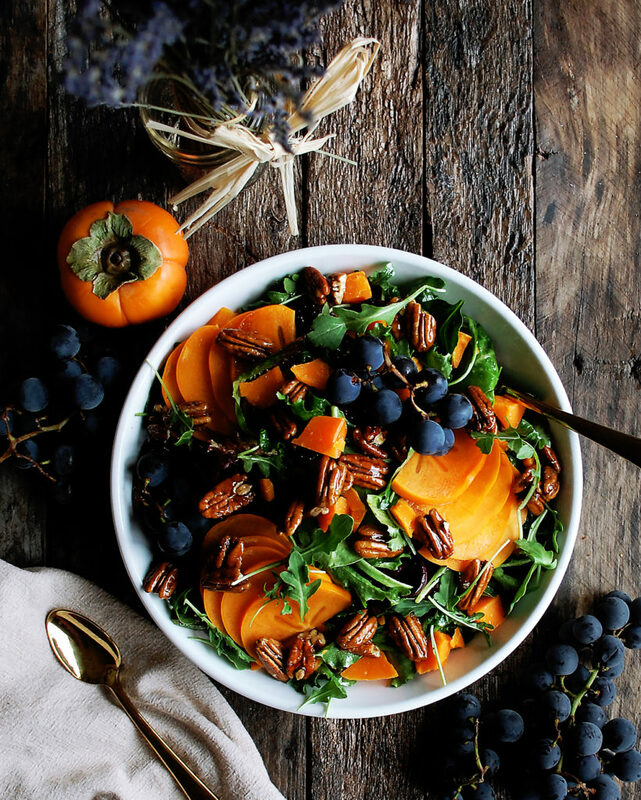 I am all about balance when it comes to eating, so even though I am a health food fanatic, you’ll absolutely find me by the fire with a big bowl of something cheesy and decadent or sweet and indulgent come fall. That being said, this year, I’ve really been getting into autumn salads. After making this harvest salad with pomegranate sage vinaigrette (and making it over and over again every single week), I decided I needed another go-to recipe in my back pocket. And it’s one I hope you guys love as well. 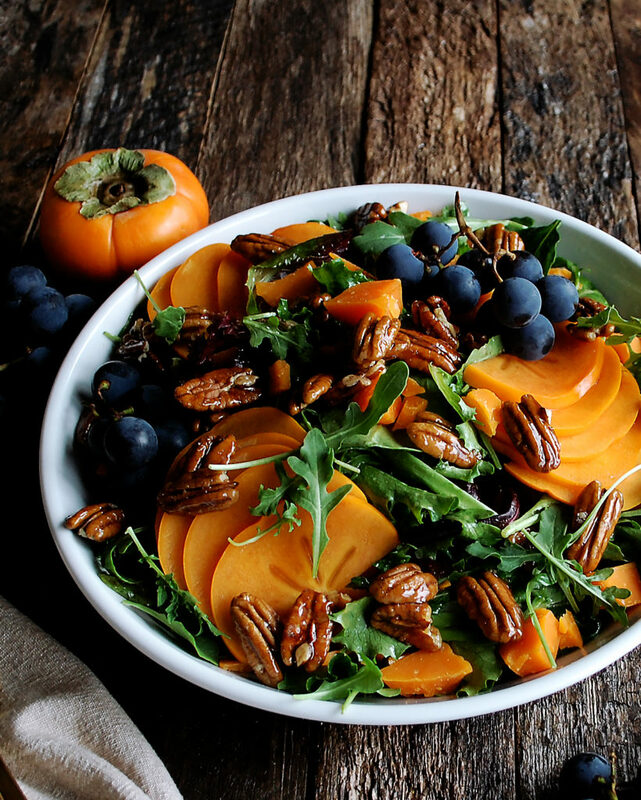 This persimmon and arugula salad is absolutely perfect. It has minimal ingredients and can be whipped up in no time. The maple mustard vinaigrette is definitely my favorite part, with a hint of fall flavor from the maple. 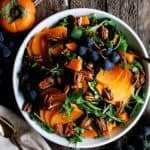 Since this salad comes together so easily, I think it is definitely going to be making it on my Thanksgiving table as a light addition to the heavier side dishes. So, the main inspiration for this salad was the persimmons. I hadn’t been able to find any, until one day I saw them sitting in the produce aisle and just had to pick them up. They are such beautiful fruit that don’t get enough attention or use. If you’ve never eaten one, they’re kind of similar to a stone fruit but with their own unique flavor and somewhat soft texture. They are quite the delicacy come fall, and I knew I wanted to simply slice them up and use them in a beautiful salad. I also knew that a potential Thanksgiving salad should be as easy as possible since there is so much else going on in the kitchen. 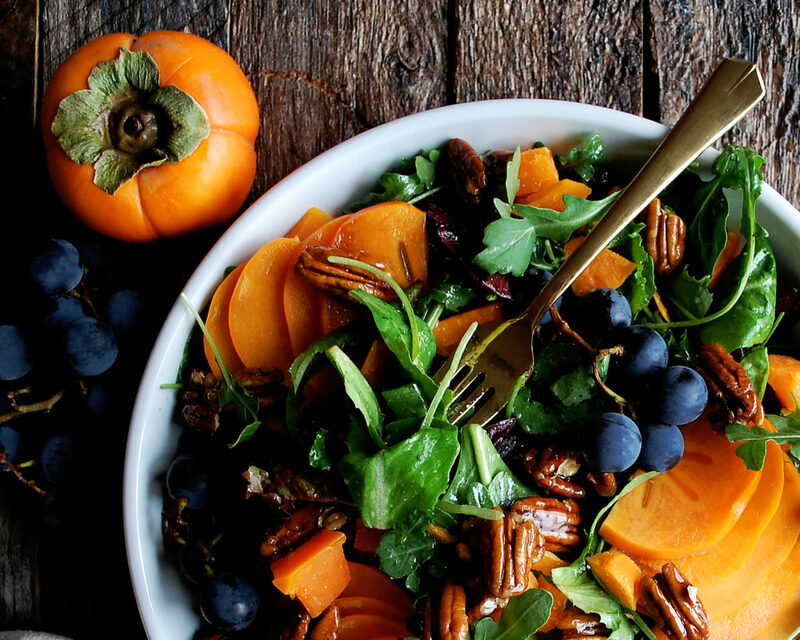 Apart from the greens and persimmons, I add sharp, salty mimolette cheese (aka my favorite fall cheese, simply because of its deep orange color), maple glazed pecans, and that is it! Oh, and there’s the maple mustard vinaigrette. Which trust me, it will become the staple dressing you’ll want to have on hand. I purposely always make extra vinaigrette, because if you’re going through the effort to make it, you might as well make enough for more salads all week long! Line a sheet pan with a piece of parchment paper. Add a small amount of oil to the parchment paper. Use a paper towel to spread the oil around, coating the entire surface. In a medium sauté pan, add the maple syrup and salt. Bring the maple syrup to a boil over high heat. Let boil for about a minute or two. Add the pecans and stir well to coat. Pour the pecans onto the sheet pan and spread into an even layer. (It’s very important the pecans are in an even layer because they will stick.) Let cool. In a mixing bowl, whisk together the apple cider vinegar, maple syrup, and Dijon mustard. Slowly drizzle in the safflower oil in small increments, whisking continuously. Add the salt. Season with freshly cracked black pepper to taste. 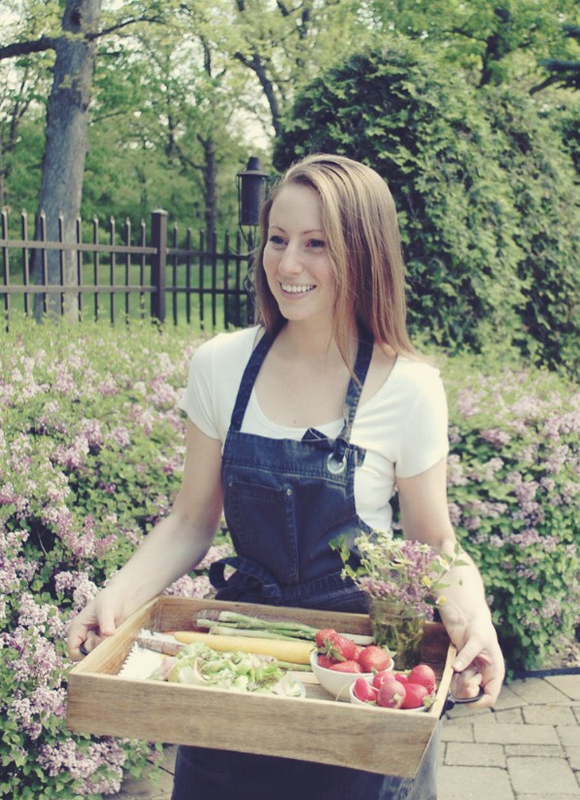 To assemble the salad, combine the arugula and spring mix in a large mixing bowl. Add the vinaigrette little by little until you reach your desired dressing amount. You most likely will have vinaigrette leftover. Save it in the refrigerator for salads throughout the week! Mix the greens and vinaigrette well. Transfer the greens to a large bowl or plate. Top with the sliced persimmons, chopped mimolette cheese, maple glazed pecans, and concord grapes (if using).